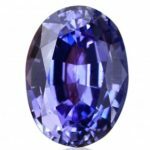 H ave you ever considered buying a gemstone while traveling as a memento of your trip? That is exactly what Stuart did on his trip to Africa last year when he climbed Kilimanjaro. 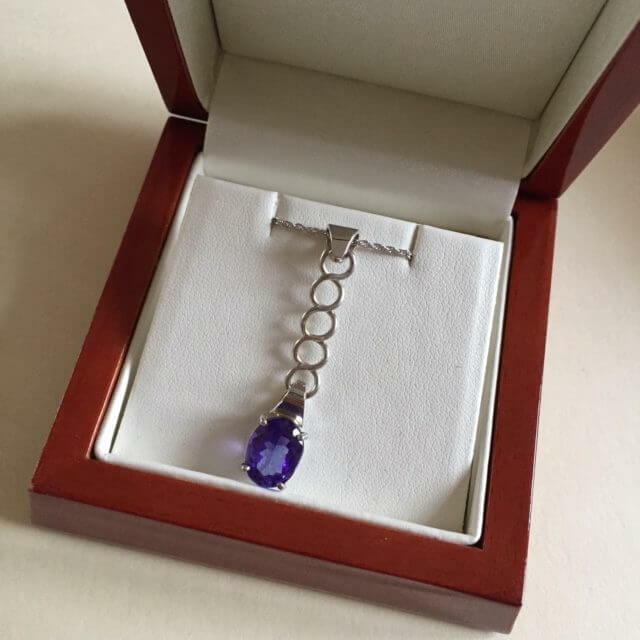 Stuart wanted to do something special for his wife’s birthday and decided to commission a bespoke piece of jewellery for her using a stunning tanzanite sourced during this trip of a lifetime. I met with him and his son locally to discuss the design over a cup of coffee. As a craftsman of musical instruments, Stuart is very creative and has an eye for design. He made my life as the designer very easy as he already had the basis for the design in his head, he just needed help to finalise the details and have it realised. 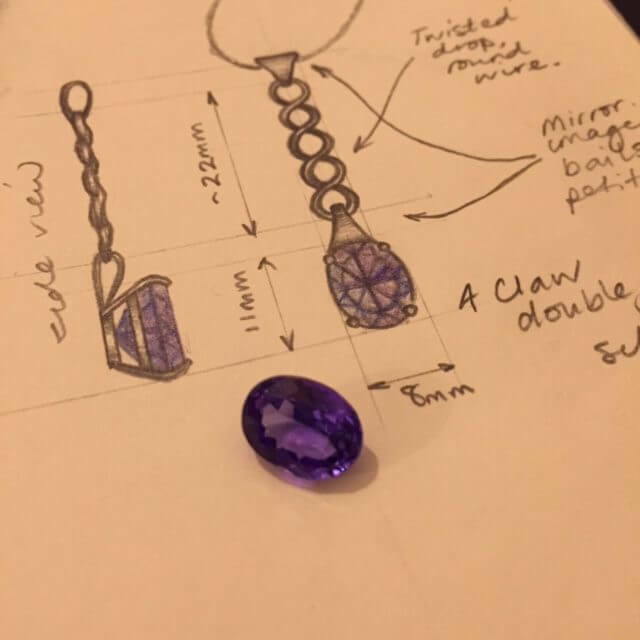 The sort of design Stuart had in mind was a long pendant that would draw the eye to this amazing stone. 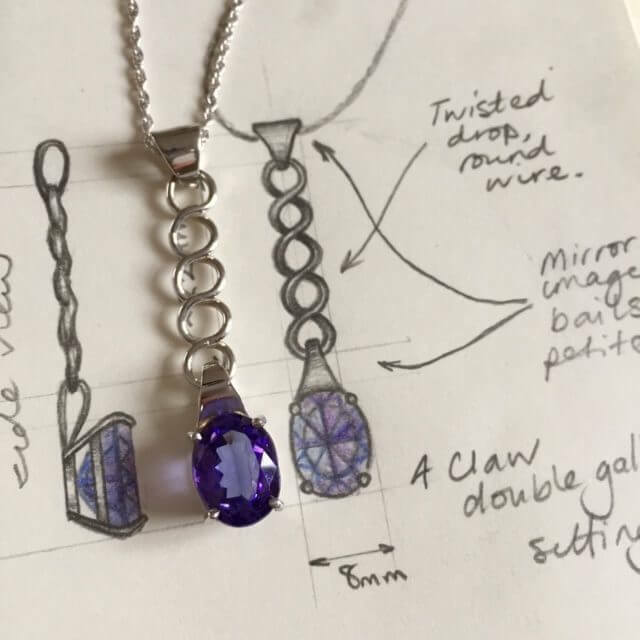 He had the idea of the twisted wire pendant to link between the chain and the setting. This has a beautifully feminine and delicate look while achieving the length he was after. Stuart initially thought a white metal would be best to complement the cool colour of the stone, but we tossed around the idea of a contrasting metal like rose gold or combining several metal colours. In the end, to keep it simple and the focus on the stone, we plumped for white gold. The pendant was ready to be given as a combined Christmas and birthday present and was presented in one of my polished mahogany jewellery boxes. 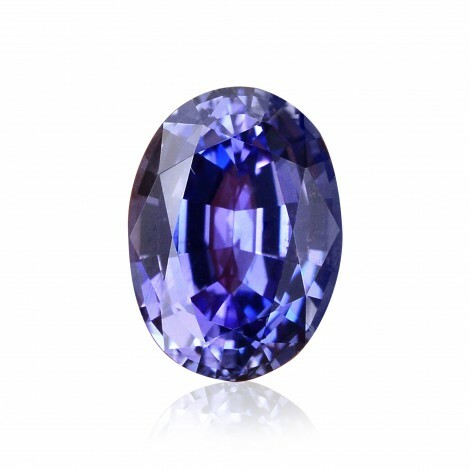 Do you have a gemstone you’d like to have made into a piece of jewellery? Get in touch to discuss your design.